Discover Dubai, the cosmopolitan city of luxury and have dinner under the stars in the desert. Fly to the land of a thousand colours and experience the multicultural city of Delhi. Explore the rose pink city of Jaipur and admire the majestic Taj Mahal in Agra - one of The Seven Wonders of the World. In Rajasthan, the golden city of Jaisalmer and the mystic Jodhpur Fort are all yours to discover. 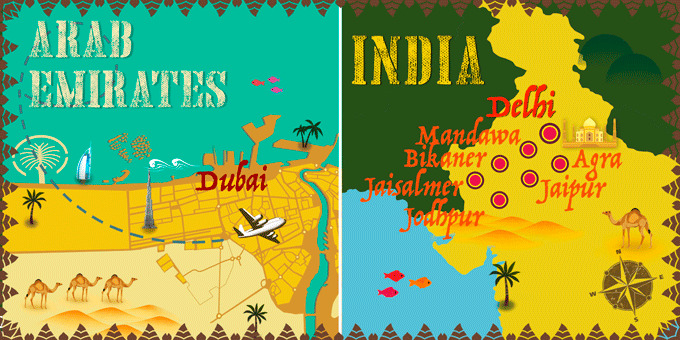 International flights: UK - Dubai & Delhi - UK. International flight: Dubai - Delhi. Transfers with an English speaking assistant in air-conditioned vehicles. Jeep transfer to the Amber Fort in Jaipur and 4x4 Desert Excursion in Dubai. * If your flight arrives in the early hours of the morning, and you wish to have your room available before 14:00, you can book early check-in in the next step of the booking process. ** Half board available to book in the next step of the booking process. *** Possibility of booking optional excursions in the next step of the booking. Please note that all additional optional excursions which are not selected at time of booking must be requested before final payment is made at least 60 days before departure. The final price will be shown once you have selected the optional excursions, in the final step of the reservation process. **** You will have the option to purchase travel insurance in the final stage of the booking. Dubai Tourist Tax: 20 AED (£4 approx) per room per night, direct payment at the hotel; Indian visa (required), drinks, tips and any other services not mentioned in what's included. Arrival at UK departure airport ready to check-in for the flight to Dubai. Night on board. Arrive in Dubai and transfer to the hotel. Rest of the day is free to discover this modern Emirati metropolis at your leisure. We recommend visiting the Burj Khalifa, the tallest building in the world and a symbol of the city of 828 meters and 160 floors. Since its inauguration in 2010, it offers the best views of the desert and the city. It is located in the largest shopping centre in the world, the Dubai Mall where 1200 stores of all kinds are located. Overnight stay in Dubai. Breakfast at the hotel. We recommend a walk through Deira, the traditional district and the old centre of Dubai, famous for its commercial importance. At dusk, take an exciting 4x4 excursion to the desert and enjoy a delicious barbeque dinner in a hammock under the stars. Return to the hotel and overnight in Dubai. Breakfast at the hotel. Spend the day at your leisure, exploring the many attractions, shopping malls or perhaps the old town. We recommend an optional tour of the city. * Overnight stay in Dubai. Breakfast at the hotel. Transfer to the airport to board a flight to Delhi. Arrive in India’s capital and transfer to hotel. Delhi is a city with a wonderful architectural legacy from its Islamic conquerers together with its spectacular historic city centre. The rest of the day free to start to get to know this fascinating city. Overnight stay in Delhi. Breakfast at the hotel. Depart by road to Mandawa. En-route, pass through authentic villages and start to enter some of the most rural parts of India. On arrival in Mandawa, enjoy a walk through the streets of the city. See the amazing Havelis - mansions noted for their frescoes depicting images of British colonial rule. Overnight stay in Mandawa. Breakfast at the hotel. Depart by road through the arid lands leading to the Bikaner Desert Kingdom - a major centre of trade during the 16th century. In the afternoon visit the spectacular Junagarh Fort, with its impressively decorated interiors. Also visit Lalgarh Palace, Karni Mata Temple and Gajner. Overnight stay in Bikaner. Breakfast at the hotel. Enter the Thar Desert by road until arriving at the city of Jaisalmer. This was an important trading centre for many centuries and presently one of the few forts that are still inhabited. Transfer to the hotel and the rest of the afternoon is free for more discovery of this city. Perhaps visit the Thar Heritage Museum or the Maharaja's Palace for a taste of kingly splendour. Overnight stay in Jaisalmer. Breakfast at the hotel. Today explore further the golden city of Jaisalmer. See the magnificent Golden Fort and take a stroll through the city’s lanes. There is also plenty of time to enjoy the famous palatial features of the city and visit Tania Tower, the Havelis, Jain Temples and Gadsisar Lake. The rest of the day free to enjoy this beautiful city. Overnight stay in Jaisalmer. Breakfast at the hotel. Continue the trip towards Jodhpur, known as The Blue City and enjoy a visit to the impressive Mehrangarh Fort with its bird’s eye view of the old city. Later continue to Jaswant Thada, an imposing marble cenotaph. Overnight stay in Jodhpur. Breakfast at the hotel. Transfer by road to Jaipur. Arrive at your hotel and the rest of the day is free to start to get to know the Rose-Pink City of India. We recommend a wander through some of the markets in the area to see the unique handicrafts and jewellery on offer. Overnight stay in Jaipur. Breakfast at the hotel. Transfer to Amber Fort - The Old Capital of Thunder. En-route, take a brief photo stop at Hawa Mahal - The Palace of Winds. Arrive at Amber Fort by Jeep. Once inside, visit the Jag Mandir or the Hall of Victory. In the afternoon, take a city tour, beginning with a visit to the Maharaja’s City Palace. Later, visit The Jantar Mantar, the largest stone and marble crafted observatory in the world. Overnight stay. Breakfast at the hotel. Head towards Agra. En-route, visit Fatehpur Sikri - an incredible Indian haunted city where the tombs of Panch Mahal and Salim Christi can be found. Upon arrival in Agra, visit Agra Fort - made of red sandstone and where, ensconced within, is the picture perfect Pearl Mosque. Overnight stay in Agra. An early start with a morning sunrise tour of the famous and spectacular Taj Mahal - one of The Seven Modern Wonders of the World. After the visit, return to the hotel for breakfast, then continue the drive to Delhi. On arrival, visit the 12th century Qutab Minar, the imposing Lakshminarayan temple. Drive past the India Gate, the President’s residence, Parliament House and the Secretariat buildings. Overnight stay in Delhi. Breakfast at the hotel. Transfer to the airport ready to check-in for return flight back to the UK. Overnight flight. Arrive back in the UK and end your trip. Passport with a minimum of three months validity. Visa is required, issued on arrival to the country. Free for stays of up to 30 days. It is advisable to drink bottled water. Passport with a minimum of six months validity and at least two blank pages. A visa is required to enter the country. Issued by the embassy or online E-Visa application one month before arrival in the country (48USD approx). 220 V in the majority of the country. Electrical sockets are European style however an adapter may be useful. There are no mandatory vaccinations for travellers from EU countries although some are recommended. Consult your GP. Foreigners cannot bring Indian Rupees into the country, although you can bring foreign currency and exchange it once you arrive. In triple room, the third bed will be a rollaway bed.